0	0	The Approval Fix	In Stock - Order before 2pm for same day dispatchWant it on Wednesday 24 April? Based on her book Approval Addiction, best-selling author Joyce Meyer teaches us how to overcome the debilitating desire to please and become free to accept the love of God and others. When we hear the word addiction, we tend to think of unbreakable habits involving drugs or alcohol. But many people struggle each day with a different kind of addiction: a deep need for the approval of others. Their unquenchable thirst for love and acceptance often causes people to suffer in relationships, give up on their dreams, and even forfeit their destinies. The key to breaking free from approval addiction, and the people-pleasing that goes along with it, is to understand and embrace the love of God and others and to be able to love yourself. 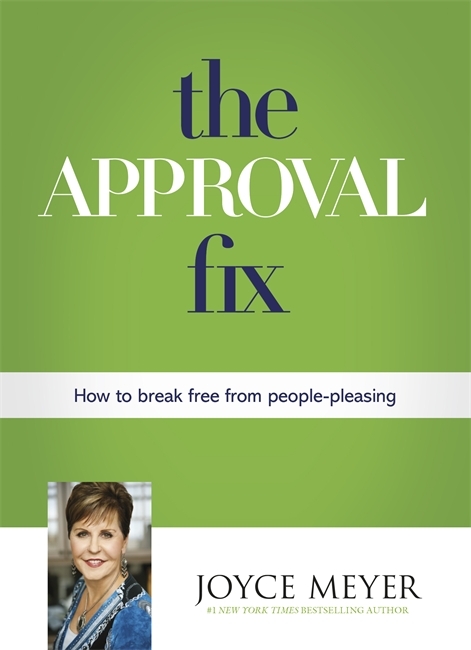 In The Approval Fix, best-selling author Joyce Meyer offers the practical insights and lessons necessary to find freedom from the need for approval. Anyone who wants to enjoy life and build healthy relationships, but struggles to feel accepted, will benefit immensely from this book, which is full of proven principles from Meyer's years of experience helping people find freedom in many areas of their lives. The Approval Fix by Joyce Meyer was published by Hodder & Stoughton in June 2014 and is our 13894th best seller. The ISBN for The Approval Fix is 9781444785654. I like Joyce Meyer's style, it's to the point but with a veneer of self-deprecating humour. It works because even though what she says might have a slight sting to it, you come out feeling better for it anyway. This book on people-pleasing is no different. It's short, easy to read but nonetheless packs a punch ... gently. We all do it, we all people-please to some degree and, as she points out, that's not really a problem. What is a problem is when we begin to tie ourselves up in knots because we think we are only good enough if we are pleasing others, if we are doing things for others, or if we are doing it for the 'glory' it brings us. When we start doing things for the sole reason of the Approval of others then we likely aren't doing them for the right reasons, and we certainly aren't keeping our eyes focused on the one who we should be trying to live our lives for. Approval seeking is an addiction and like all addictions we need to see it for what it is and work through the steps to give it up. This quite short and easy to read book could be a good step on that path, and is certainly a good addition to the shelf of any Joyce Meyer fan ... even if you don't think you have an approval addiction. Take a peek at some articles related to The Approval Fix. Got a question? No problem! Just click here to ask us about The Approval Fix.